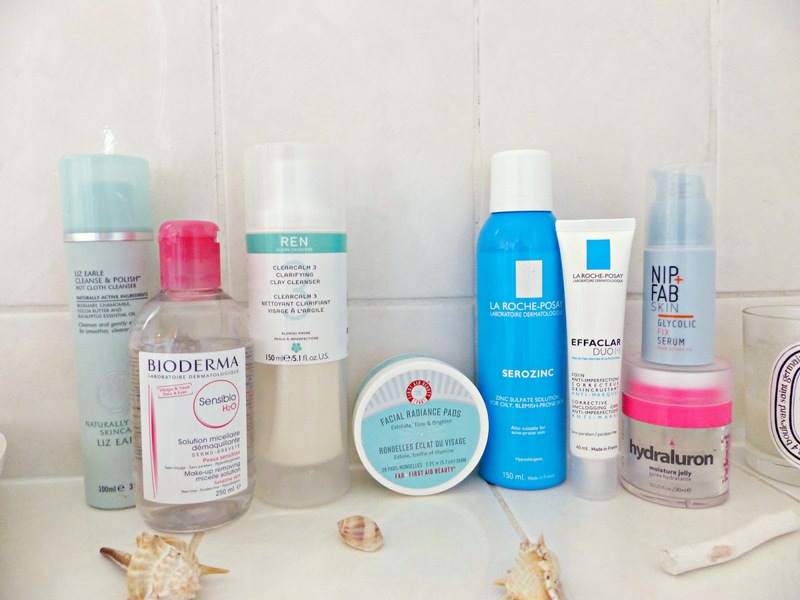 I've been saying for a while that I'd do an updated skincare routine (my last one was in about January!) once I'd finished trialling lots of new products and found something that works for me. 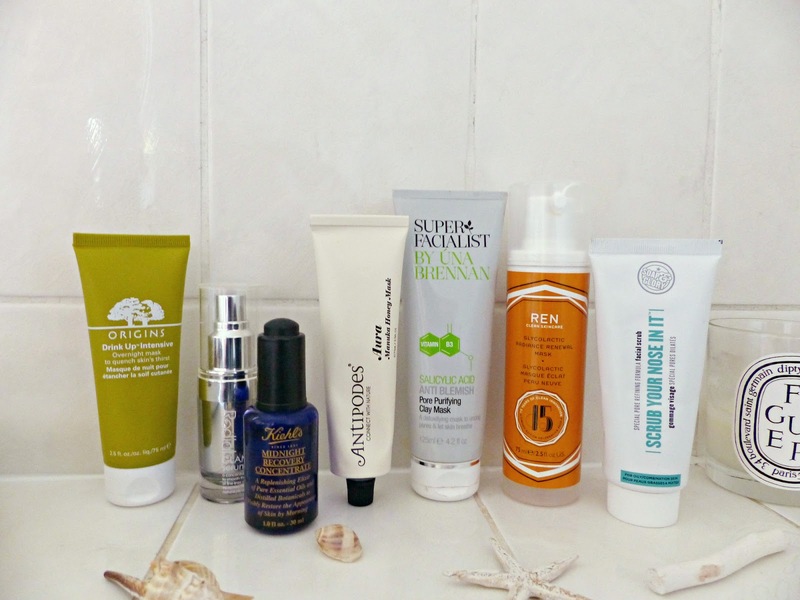 This month I've stopped testing anything new and just stuck to these products. My skin is now in the best condition it's seen for years so I thought the time was now! I have combination skin and tend to get oily in my t-zone and have enlarged pores. It's definitely blemish-prone but is also dehydrated and can tend to look dull. Obviously what works for me may not work for you but if you have any similar concerns, these products could be well worth a look! I didn't initially get the hype about this product but since using it as a morning cleanser (instead of to remove makeup), I've warmed to it a lot, though I still think it's very expensive for what it is. You only need a pump or two for the entire face and this stuff seems to last forever, possibly due to the fact the packaging stops you ever getting too much out. It starts off as a gel but turns into a milky emulsion. It smells really nice (but isn't overly fragranced) and leaves my skin feeling plumper and healthier. I pat my face dry with a clean towel before applying a little of the Pixi Glow Tonic with a cotton wool pad. This contains 5% glycolic acid so smells beautifully sweet and fruity. It's an AHA acid toner so chemically exfoliates the skin in a way that's gentle enough for everyday use. My skin looks immediately brighter and more glowing and I love this as an instant cure for my dullness as well as to help fade old blemish scars and hyper-pigmentation. I don't necessarily use this every day but its enough a part of my routine to include here. For me, this product does several things to help with blemishes old and new. Firstly it provides a hydrated but fairly matte finish for my skin. It also helps clear up any active breakouts I'm suffering from and I feel it stops them scarring so much when they do dry out. However the main reason I use this is again to help improve those older blemish scars that have become pigmented over time. I feel my skin looks so much better since I started using this and I will always re-purchase it. I really love this product but I'm not impressed that it has increased by about £5 in price since it first started gaining buzz in the blogging community, as the watery texture means you get through it fast! I use 1-2 pumps for my entire face and the extremely light texture means it skins in right away and adds some serious hydration. It smooths out and dehydration lines instantly without feeling heavy or rich on the skin. 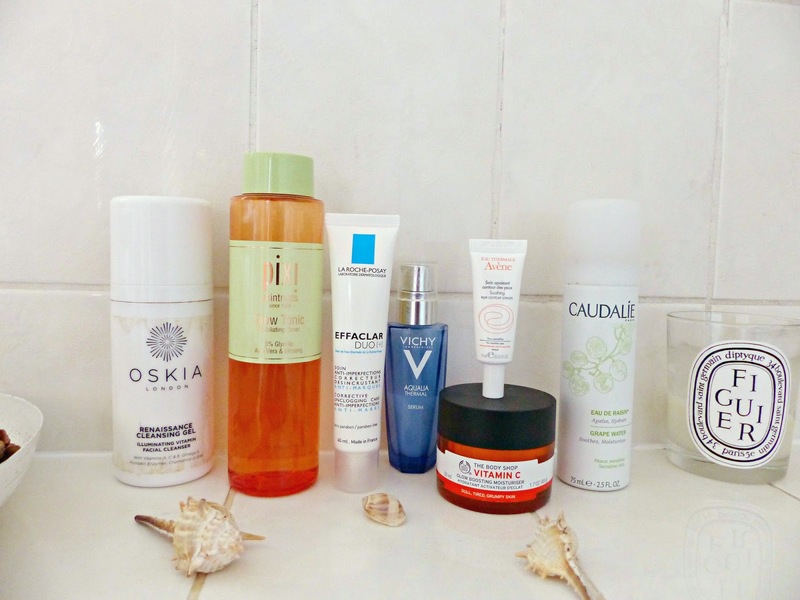 I tend not to spend much on eye creams as you can't really reduce darkness caused by hyper-pigmentation and cheaper products reduce puffiness just as well as high-end ones in my experience. I really like that the packaging allows you to fully control how much product comes out. I dot a little bit in the eye area and it instantly feels fresh, hydrated and less puffy. I've tried a few moisturisers in the past year or so since I got into skincare, however I've never felt truly blown away until I discovered this! The gel formula is perfect for my combination skin as it allows the product to full absorb, adding hydration and glow. All for £16! This doesn't contain SPF but I will use a foundation or primer containing some protection. If I'm just in the UK I rarely wear a sunblock because I'm not in direct sunlight very much on a day-to-day basis and obviously the more melanin in your skin the less susceptible you are to sun damage. However if you have fair skin, especially if you use AHAs in your routine, you'll want to add this step in here. Whilst I do occasionally use the Beauty Elixir, I actually find I prefer the grape water these days. I just feel it adds more lasting hydration. I use this as the last step before applying my makeup but it's also great if you're prone to redness or if your skin is feeling tight following an anti-blemish treatment. This is the one product in my routine I think I will probably replace as, although I really like this product I prefer an oil based formula as it's just more effective. I will probably switch back to my Body Shop Camomile Butter or Oil. If you're not into oil-bsed formulas then this lotion texture will be great for you. I gentle massage it into my face and across my closed eyes before removing it using a muslin cloth soaked in warm water. I find it nice and effective and my skin feels soft after use. I have tried a few more affordable micellar waters but this is the one for me! I find it really effective so I don't find myself using as much as I do with the Garnier version. It actually lasts me a pretty long time too. Especially if I didn't have a muslin cloth to hand for the Liz Earle step, I remove anything left behind with some Bioderma on a cotton wool pad. For my eye makeup especially, I like to ensure every bit is gone. This is a serious game-changer for me! I use it as a second cleanser after removing my makeup. I take 2 small pumps on my slightly damp fingertips and apply it to my mostly-dry face. I tend to take my time to massage it all in gently before rinsing it. It's so hard to find blemish treatments that aren't drying, which is why I love this so much. Not only does it clear up blemishes and stop new ones from forming, but it leaves my skin feeling soft and hydrated but free of impurities. These are super-handy pads that come already soaked in glycolic and lactic acids. They do a really similar job to the Pixi Glow Tonic, though I personally think they're a little bit stronger. They're still really gentle though and give my skin an immediate glow boost whilst helping treat old blemish scars. I try to avoid active breakouts when using these or the Pixi Glow Tonic so it doesn't aggravate them with exfoliation. Again, I don't always do this, especially if I have a lot of active breakouts. If I don't use an acid toner then I don't bother with traditional toning at all as the Serozinc I use next is kind-of a toner anyway. I do a quick spritz of Serozinc, which is a product I really like as I feel it helps balance my skin without drying it out. Whilst this alone isn't a super-strong anti-blemish treatment, it's a great step in my wider spot-reducing routine. I can immediately feel it refreshing my skin and calming down any angry breakouts without just drying them out. I then apply the La Roche Posay Effaclar Duo +, same as in the morning. I'm sure you'll have realised by now that I love my AHAs and Nip + Fab is one of the few brands at an affordable price-point that has an entire range focussed on Glycolic Acid. I use this as an overnight treatment before bed and I love waking up in the morning with my skin looking fresher and more glowing. It's a gel formula, which is my preference and I only need 1 pump for my entire face. If my skin is angry or breaking out then I skip this step and sometimes use a Tea Tree-based treatment instead. I use this as my night cream as personally I don't find that rich creams really sink in as well as a gel. According to Indeed it works for both day and night, which I agree with; sometimes when I'm travelling I'll just take this. It's packed full of hyaluronic acid, which is amazing at retaining moisture in your skin. I also really like the super-hygenic pump packaging and use 1-2 small pumps for my face. This is an old favourite of mine! It smells so amazing from all the essential oils packed into it and I apply in after or instead of a night cream as it has a cream-like formulation. You only need a tiny amount so a little goes a long way and I use this maybe once a week when my skin is looking in need of some hydration. When I wake up in the morning my skin looks plumper and healthier. When I don't have time or can't be bothered to do a separate oil and serum, I reach for this as my only overnight product. I picked it up as it was massively reduced to £10 (!!!!) on their website and whilst I don't think I'd pay full price for it, I do really like this. It is a very oil-based formula so the pump does sometime squirt it all over the place, which isn't ideal! I use 1 pump for my entire face and I find it sinks in nicely to my skin. It definitely adds some hydration and smooths out and dehydration lines whist also leaving my skin soft and fresh. This is similar to the Rodial serum but it works better for me and is a slightly heavier, more oil-based formula. Although it's not the most travel-friendly packaging I prefer the glass bottle with the dropper as the easiest way to dispense an oil. I use 1-2 drops for my face every other night in place of a night cream and the results continue to amaze me every time! My skin looks plumper, fresher, more glowing and better in every way I can think of! This isn't so much something I reach for when I'm having a really awful breakout but when I have a few blemishes, can feel some developing or just want my skin to look and feel a little more balanced. Honey is a natural disinfectant and the formula is very runny. I love this as it reduces blemishes whilst being really hydrating. It also makes my combination skin feel more balanced overall and the texture more consistent. Once or twice a week I spread a thin layer over my skin, leave for 15 minutes then rinse it off. This is the one I go for as and when my skin is in full-on meltdown! It's not too drying but you can feel the sensation of it working! It's only a 5-minute treatment so as you can imagine, it's pretty intense. I usually use it before bed and I find it gives an immediate brightening effect, then the next morning my active breakouts are greatly reduced in size and redness. When I'm breaking out, I focus treatment products on clearing my skin up. When my skin in clear, I turn my attention to the dullness and dehydration. As with all AHAs, I avoid applying this on any active breakout sites so tend to go for it when my skin is fairly clear. The ingredients mean it smells lovely and fruity and it comes out as a sort of gel formula. As with the REN cleanser, the packaging is really hygienic and functional and you can see how much is in the bottle. I spread a thin layer across my face and leave for 10 minutes before rinsing. The results are dramatic and immediate! My skin look so much healthier, so much more glowing and over time I feel it's helped to fade those older blemish marks. I use this one once a week. I avoided this product for the longest time as I've moved away from rough face scrubs, however after trying it, it's not like that at all! It's a treatment to be used on the t-zone and although it contains extremely small and gentle exfoliating particles, it's also an AHA. You simply gently rub it into the area, leave for a few minutes (it feels quite tingly!) then rinse. When products say 'pore-refining' I usually think to myself 'yeah, sure...' but this genuinely works for me! It's also amazing for the slightly tougher dry skin I get around my nose area. I use this about once a week. 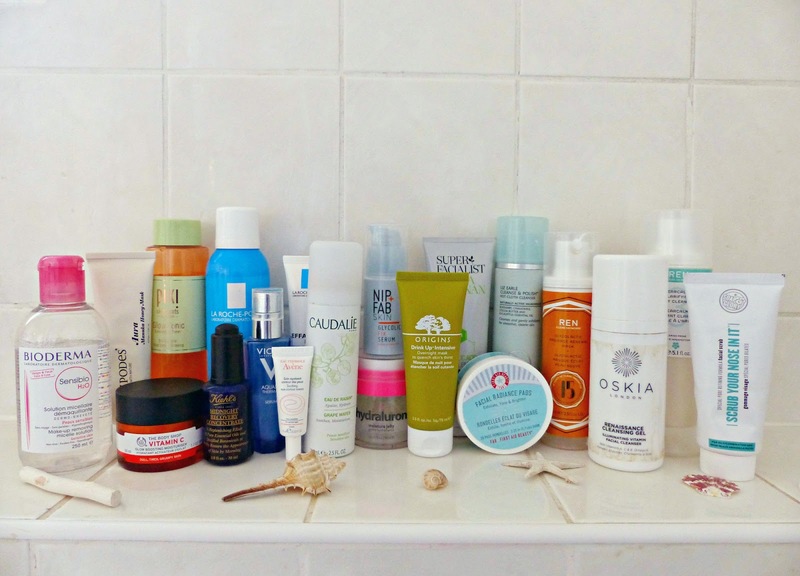 So there you have it: my current skincare routine in full! Have you tried any of these products? What did you think of them? What are your skincare staples? 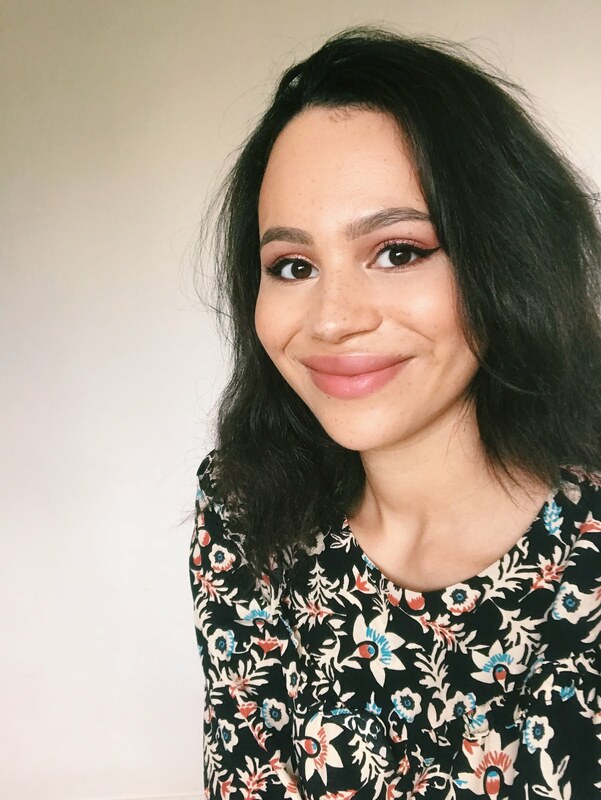 I love the products you have included in your routine! I think I own about half and I want the other half! I really need to try some of the Nip + Fab range! I couldn't be without Avene's acne range and find the Triacneal works so well on my skin! The Pixi Glow Tonic does sound amazing - seems like it'd be perfect for my skin! Great post. I thought i had a lot of skincare! haha i tend to stick to the same things if im not testing products right now im loving Fillerina just recently got it and omg! Wow! You have the most amazing skincare ever! Compared to this I am useless!! 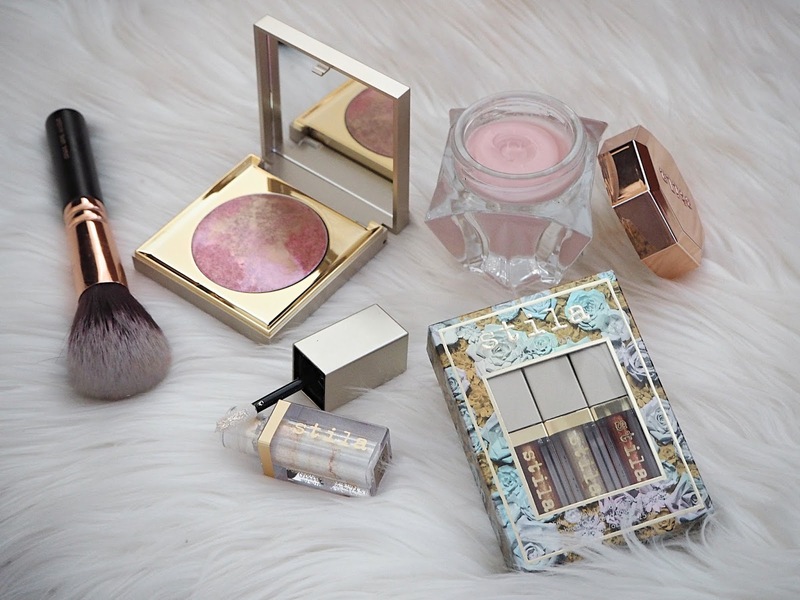 I always love looking at what other bloggers use in their daily routines! I really love REN's glycolactic mask and Kiehl's midnight recovery concentrate. Currently loving Trilogy's rosehip oil (can't stop raving about it!) and Antipodes Manuka Honey mask is in my wish list. The REN ClearCalm cleanser sounds incredible, I'll definitely check it out! I'd be lost with my La Roche-Posay Effaclar Duo [+], Liz Earle Cleanse & Polish and Keihl's Midnight Recovery Concentrate! I loved reading this post so much, it was in detail and interesting to read. What a great range of products, I've tried a few of these and love the origins drink up mask as my night cream every now and then. I really want to try more from la roche posay, especially serozinc! My skin care routine is cleansing, exfloitation, and using best anti aging treatment by Dermology. Do I need to change this in winters?